If you’re still not entirely sure of your skin type, trust us, you’re not alone. The first step to beautiful, glowing skin is knowing your skin type. Once you know your skin type, you will be able to choose the right skin care products. For example, if you have dry skin, an oil-free moisturiser may not be hydrating enough. If you have oily skin and use emollient products, it’ll just make your skin oilier. 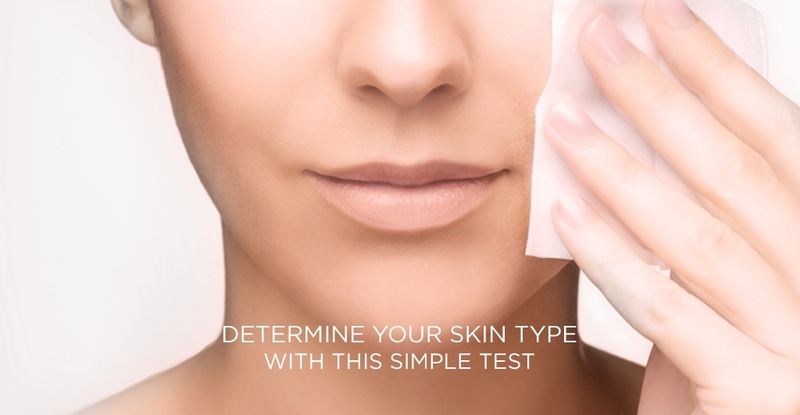 Here’s a simple and fairly accurate skin type test and all you need is a piece of tissue! If all tissue pieces drop off immediately with no trace of oil, you have dry skin. Often, your skin feels dry, flaky and/or tight. Products to go for: Pick a mild and gentle cleanser which cleans your skin without stripping it off of oil. Look out for hydrating ingredients like hyaluronic acid to keep skin hydrated & maintain the moisture from within. For moisturisers, pick one with a rich lotion, cream or velvety serum texture. If the tissue pieces stick for a while before falling with no visible patch of oil, you have a normal skin type. Products to go for: To maintain skin condition, stick to mild, gentle & hydrating skin care. To keep it glowy & dewy, add in an antioxidant serum! Recommended Facials: Classic European Facial for skin without much concerns, or Oxygeneo+ Facial with Tripollar for matured skin. If the tissue pieces stick on your skin with visible oil patches, you have oily skin. Products to go for: Pick skin care that is water-based or with a light gel texture. Richer textures may make your skin oilier and clog pores. Look for non-comedogenic & sulfate-free products, and ingredients like Salicylic acid. Recommended Facials: AcnePro Defense for acne-prone skin, or Illuminating Glow Facial. If you have combination skin, 2 or 3 pieces will stick (usually the T-zone and/or chin) with some visible patches of oil. Products to go for: The trickiest of the lot, combination skin requires a delicate balance of keeping it adequately moisturised without piling on pore-clogging oils. Go for a gentle sulfate-free cleanser, skip astringents and alcohol-laden toners, and look for a lightweight & hydrating moisturiser. Recommended Facials: Facial with Microdermabrasion, or Illuminating Glow Facial. Regardless of skin type, shield your skin from the sun with a sunscreen daily! Pick one that’s at least SPF50 with a broad-spectrum formula to protect your skin against both UVA and UVB rays. Got a question? Ask us in the comment box below! The above are a generic test and facials for most skin & skin types. For an accurate skin diagnosis & facial recommendation, simply arrange an appointment at any of Renaza Wellness Lifestyle Lab outlets for a free consultation! woow! what an amazing article to read. Extremely helpful and informative. I was confused about my skin type. This article has helped with the best and now I know, I am a combination skin type. Very effectively explained. Thank you so much for this article. Couldn’t have asked for better. Keeping posting such information.